After a very successful two years in Topsham Devon, thoughts turned to Cornwall for the 2013 Plymouth IVC weekend. A wonderful 1700’s farmhouse 1.5 miles from St Merryn was chosen and proved to be the ideal venue in a central location. Demand was so high for the weekend that additional accommodation had to be taken out in an adjacent property! 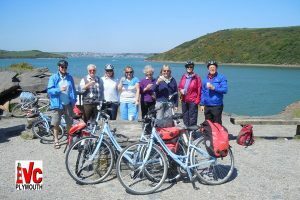 Saturday was spent cycling or walking the Camel Trail from Wadebridge into Padstow. This is a nice and easy flat cycle route, previously being part of the old London and South West Railway branch from Bodmin, and runs alongside the River Camel giving lovely views, see photograph on the left. Evening saw a return to Padstow for an evening meal at the Shipwrights on the Quay. There were plenty of eating places in Padstow, or ‘Padstein’ as it is often referred to due to the preponderance of outlets owned by Rick Stein. Our chosen venue of the Shipwrights Arms was not one of these however, us Plymouthians being of more modest means! The Sunday morning minibus taxi took all 15 of us to the lovely fishing village of Port Isaac, where lunch was taken at the Edge Restaurant overlooking the cliffs. As is well known, Port Isaac is also the outdoor filming location of ‘Port Wen’ in the ‘Doc Martin’ series and the afternoon started with an exploration of the lovely village. 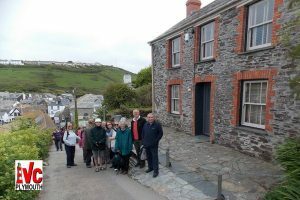 The photograph on the left shows most of the group outside Doc Martin’s house in the series. This was followed by an invigorating walk over part of the South West Coastal Path, returning to the village for a welcome cooling drink! Being one of the smaller IVCs, it was very pleasing to be able to organise such a brilliant weekend and satisfying that such a large proportion of the club were able to attend. It was thought that it would be very difficult to ‘top’ Topsham last year, but St Merryn proved once again that our little club can deliver!